Mr. Browning has achieved Martindale-Hubbell’s highest rating for legal ability and professional ethics, AV Preeminent®, as reflected by the opinions of his peers and members of the judiciary. 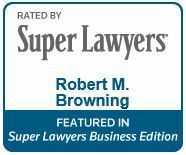 He has also been named as a Texas Super Lawyer®. Mr. Browning’s practice focuses on catastrophic personal injury, wrongful death, construction defect, and professional liability cases. He has successfully defended clients at both the trial and appellate level. After receiving his Bachelor of Arts degree in Foreign Affairs from the University of Virginia in 1992, Mr. Browning worked in Washington, D.C. for the Concord Coalition – a non-partisan deficit reduction advocacy organization started by former Senator and presidential candidate Paul Tsongas and former Senator Warren Rudman. He then returned to Texas and earned his Juris Doctor from the University of Houston Law Center. He has lived and worked in Houston since graduating in 1996. He is licensed to practice in all courts in Texas and is admitted to the United States District Courts for the Southern, Eastern, and Northern Districts of Texas, the United States Court of Appeals for the Fifth and Eleventh Circuits, and the United States Supreme Court. Mr. Browning is active in Houston Bar Association activities and local politics. He is a Member of the Texas Association of Defense Counsel; Defense Research Institute; and the Houston Bar Association, Fee Dispute Committee; and is a past President of the Eastwood Civic Association. He is a frequent speaker at seminars presented by continuing education providers, corporations and insurance companies. Member: State Bar of Texas; American Bar Association; Houston Bar Association; Defense Research Institute; Texas Association of Defense Counsel; Houston Bar Association Attorney Fee Dispute Committee (2001 – present); Professional Liability Underwriting Society; Fellow, Houston Young Lawyers Association; Fellow, Houston Bar Association. Editor, Texas Association of Defense Counsel’s bi-annual non-medical Professional Liability newsletter (2000 – present).